Reality check. The simplest speaker is a widebander on an open baffle. Look ma, no crossover or box. A bit fat sloppy kiss or 'keep it simple, stupid'. As such, the genre at large suffers from garage odour. It smells of widebanders only happening to people who don't know how to write a proper filter or who can't ace a decent enclosure because they got no saw. And sure, very basic DIY widebanders do happen. It's the Tao after all. Their limitations of little to no real bass, short treble and a forward-to-bright presence region with very serious response wiggles across the board now overshadow the more ambitious efforts. Having heard one or two low-rent jobs mints a "heard one, heard 'em all" attitude. Now all widebanders get written off as fit only for beginners; or those tone deaf to their various shortcomings. They push to the very fringes of the hobby, some deservedly so. On the other end of the spectrum are the most serious efforts with their steep prices. Seeing a single 8-inch driver on a big flat rectangular Ply baffle done up in shiny piano gloss selling at north of €100'000 will seem like a rip-off even to those who look deeper. With paper the preferred widebander cone, justifications for high material diaphragm costs à la Beryllium or lab-grown diamond don't hold. Without filter parts, the Duelund capacitor crowd isn't served its common bill of materials either. "What the hell am I really charged for?" becomes a natural reaction. At €15'900/pr, today's Nenuphar can already create the same. Realistic answers are R&D, low-volume production and performance. In the absence of much simulation software as exists for standard sealed/ported speakers, designing and building one's own wideband driver eats up far more time, hence money. The same goes for the lengthy prototyping of enclosures to maximize and linearize the bass in just the mechanical domain. Low-volume production is not only costlier but fewer sold units mean that each must carry a higher amortization percentage to recoup upfront R&D. How about the age-old decision between pricing something purely on build cost times 'x' math or what one competes against? If a widebander in a simple box performs like or better than a €15'000 conventional multi-way from a big established firm, why should its maker sell it for less? This doesn't account yet for the significantly costlier magnetics which are common to widebanders; nor potential cost savings on amplification which no longer must drive reactive filters and subwoofer-style woofers. How and where on these points prospective buyer come down obviously varies. At the end of the day though and as long as price doesn't eclipse sanity—arguably as loaded a notion as value—the likely most common view will factor raw performance first and foremost. If so, Nenuphar would have to be as linear as a conventional speaker of equivalent price; offer similar bandwidth and loudness potential; then do something noticeably different or significantly better to decide in its favour. That at least was my head space and approach to this review: identify general competitiveness against our €12'000/pr Audio Physic Codex 4-ways; then hone in on any different/better aspects to suggest what type listener in this price range might favour Nenuphar and why. Back on R&D, "it lasted for over a year. The goal was something completely new which would outperform our 8" drivers in nearly all aspects. Due to increased moving mass, we needed a more powerful motor. The full Neodymium version contains 81 magnet slugs with a combined weight of 1.5kg which deliver 2.4 Tesla in a 9mm tall gap. The fully underhung voice coil with ±3mm excursion (max ±6mm) remains under 100% magnetic field control nearly all of the time. With uniform field strength along the gap height, raw power, linearity and minimum distortion are all at their best. To maintain 0.01mm tolerance of all these elements, the magnetic components are manufactured on computer-controlled CNC lathes. The same goes for our phenolic spider which acts 100% linear through even maximum excursions without absorbing acoustic energy like conventional resin-soaked cloth spiders do. The downside is that each of our inner suspensions must also be milled by CNC." About R&D setbacks and tests of faith, "for a very long time we were dissatisfied with the sound. There was a time when we had no more bass than from our 8-incher to be basically pointless. Multiple times we had cone geometry measuring absolutely linear and looking amazing to the point that studio monitors would be envious. Yet the sound was dull and boring. That was most frustrating and we occasionally thought that our dream of an amazing-sounding 10" widebander was futile. But finally we arrived at the 4-cone design of main membrane with three whizzers. The smallest cone is responsible for the very highest frequencies. With a single standard whizzer, we'd never have hit 18kHz with a driver that also makes 30Hz in a proper cabinet. So adding the little whizzer solved one issue but there were plenty more. Whenever you add a whizzer, there's interference between the main cone and it. The mini and main whizzer got on really well and the sound was far better with than without it. But there was still a geometry issue to work out the ideal diameter, height, surface, geometry, stiffness, damping and coating for this application. "For achieving the right sound pressure at any desired frequency, the most important variable of these is geometry. There was one which gave us an amazingly rich colourful midrange but also interfered with the main cone to pump up certain central frequencies. Since shouty vocals were undesirable, we had to do something about it. That's where the third whizzer enters. It's a very elegant solution to changing the interference patterns between the other whizzers and cone. Due to its changed geometry/distance, the corrective whizzer attenuates the amplitude of these modes. Now the overall sound became sweeter, richer and more natural. At that moment we knew that the triple whizzer was our way forward. Together with our ultralinear low-damping spider, full-copper faraday ring, underhung voice coil, powerful motor, high excursion and multi-coat waterproofing for the paper, the result became our F10 Neo. Thanks to the technologies we developed, we gained more control over its behaviour, sonics, response and Thiele-Small parameters than ever before. Those parameters are an FS of 30Hz, Re of 5.5Ω , Le of 0.006mH, Qt of 0.43, Qes of 0.44, Qms of 0.76mm/n, Vas of 127 litres, SD of 346cm² , BL of 9.7Tm, sensitivity of 92dB and overall impedance of 6Ω. The driver is 26cm wide, 10.7cm deep and weighs 6kg." 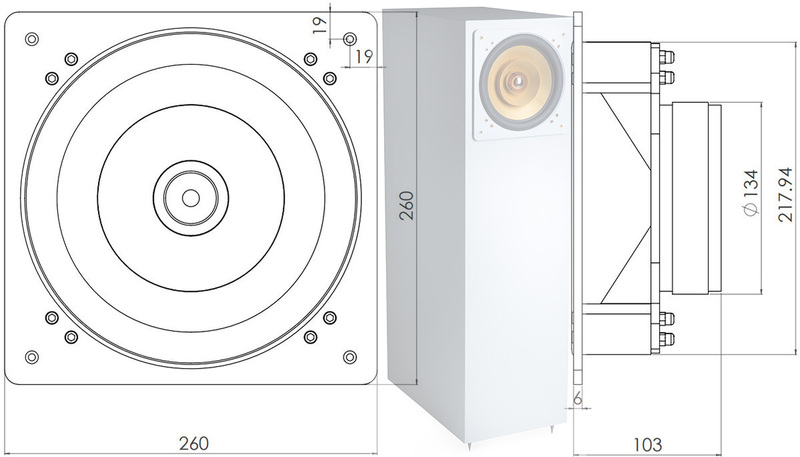 By August 6th, "the speakers were dispatched last week so should arrive this week. You will receive a lovely white slightly ivory lacquer. We will introduce the same hue for our driver baskets. We took photos prior to shipping so in a few days I'll email those. Your drivers have been burned in for about a day. One more day with bass-heavy fare should do the magic." Had these been Lowther, Rethm or Voxativ types, break-in would be far lengthier. Besides less fuss over potential gain noise—that background hum from amplifiers which weren't optimized for such efficient loads—more rapid break-in is another practical benefit for Grzegorz's decision at a more standard sensitivity spec. The chief one is higher LF bandwidth of course. If we look at the impedance plot of the driver in free air, the peak at 225Ω shows high Qts which "makes it possible to mount the driver in a reflex box and still get usable low frequencies." As fellow speaker maker Robert Gaboury added who has worked with commercial wideband units, "at least to me this is a novel concept for full-range drivers. Most contemporary ones rely on stiff cones, stiff suspensions and large magnets to extend high frequencies at the expense of low frequencies. Qts of 0.15 to 0.25 are common to indicate that the drivers won’t put out any bass unless fitted to large resonant enclosures, i.e. rear-loaded horns. Cube's resonant peak when their driver isn't in free air but a reflex box or more elaborate tapered box will split into a succession of smaller harmonically spaced peaks. It'll look quite different then." Robert's comments addressed a personal misreading of this graph as in-box not free air. I'd assumed that such a massive spike would act as a rev limiter on amps which rather than power double suddenly put out a mere fraction of their power into such a high impedance. In reality, unless one attempted to drive just the raw driver, an amp would never see this severe a peak from it.